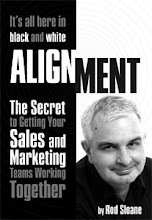 Sales and Marketing Alignment Blog from Rod Sloane: You Better? You Bet! I have just returned from the Professional Speakers Association (PSA) 2008 Convention. This is where speakers go to learn more about the craft and business about making a living from speaking. Now the PSA is a wonderful sharing organisation. We leave our egos at the hotel entrance and encourage each other to improve. Naturally being the brilliant speaker I am, I was speaking, but you know that I learned something….I am not quite as good as I think I am. What core skill/talent do you have that you are good at? My suggestion is to take a class in it, whatever it takes to improve. Otherwise someone is who more dedicated than you may well leapfrog you.